I wrote about the obsession of Flipkart (and Myntra) with "mobile-only" without even having an iPad-optimized app! I also talked about the stunning advances being made in voice-search by using machine learning, cognitive learning, natural language processing, even as voice-based search capabilities of e-commerce companies - including Amazon - remain abysmal. Finally, I also included several use-cases that these companies need to work on incorporating into their capabilities. 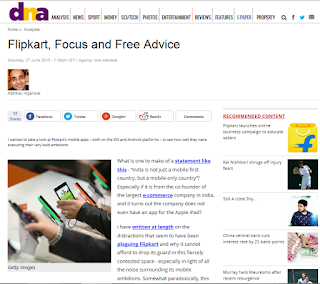 That piece, Flipkart, Focus and Free Advice, appeared in DNA on June 27th, 2015. 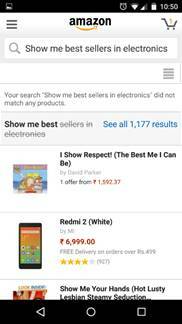 Flipkart, Focus, and Free Advice – Shipping Charges Also Waived! What is one to make of a statement like this - “India is not mobile-first, but mobile-only country”? Especially so if it is from the co-founder of the largest ecommerce company in India, and it turns out the company does not even have an app for the Apple iPad? I have written at length on the distractions that seem to have been plaguing Flipkart and why it cannot afford to drop its guard in this fiercely contested space - especially in light of all the noise surrounding its mobile ambitions. Somewhat paradoxically, this post is about offering advice to Flipkart that calls for some diversification! As a logical next step, I wanted to take a look at Flipkart’s mobile apps – both on the iOS and Android platforms – to see how well they were executing on their very bold ambitions. As an aside, I also wanted to see if these (and competitive) mobile apps were leveraging all the computing power now available on tap inside these tiny devices. After all, apart from the recent – and amazing – advances Google has made in its voice-based search capabilities, there was this stunning demo from Hound that gave a glimpse into the huge advances that voice-recognition, search, and machine-learning technologies have made in the last decade. The results were, to put it mildly, massively disappointing – which I will describe in some detail. It should be clear that Amazon and Flipkart and SnapDeal are going to be at each other’s throats in the Indian online retail market. This is one battle from which neither player can walk away. Amazon has lost the China market to Alibaba (“In the first quarter of 2014, Alibaba's e-tailing site had a 48.4 per cent market share against Amazon China's less than 3 per cent.” If that was not enough, Alibaba and Foxconn are in talks with SnapDeal for a rumoured $500 million investment!). So what does Flipkart do? Three things, to begin with. First, it needs to get serious about software. When you have a web site that offers millions of products from tens of thousands of resellers to millions of customers that reside in tens of thousands of cities and towns and villages, you need to make sure that your customers are seeing the products that are of most relevance to them, and which they are most likely to buy. If that problems looks like a nail to you, specifically a large-scale optimization problem with a huge number of decision variables, then large-scale computing and regression modelling are the hammer. You need to be applying this hammer to the almost infinite number of nails in front of you, all day and all night long. This is what enables you to present an ever-relevant basket of products to your customers, which keeps them engaged when on your site, and which hopefully makes them buy more often than not. 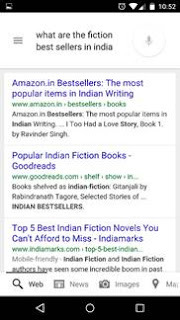 Flipkart needs to take a close, long, hard look at its search capabilities – about which I will talk later in this post – and its suggestions engine, because both are very subpar at this point. If it’s any consolation, while Amazon is certainly better in the search department, its capabilities in this area are nothing great either, yet. Where Amazon scores over its competitors – every single one of them - is its huge and ever-growing corpus of customer reviews. Flipkart probably recognizes the important of this corpus of customer reviews, but has run into rough weather over the expected problem of fake reviews. For inspiration on where the trifecta of search, machine learning, and e-commerce could venture – with Big Data in tow - one can turn to the story of how the popular American TV game show “Jeopardy” became the battleground for IBM researchers to build upon their experience with Deep Blue (the computer that had beaten world chess champion Gary Kasparov in 1997) and to build a computer that would defeat the reigning champion of Jeopardy. That happened in February 2011, after four years of work led by IBM researcher David Ferucci and “about twenty researchers”. This required advances in machine learning and other esoteric concepts like LAT (Lexical Answer Type), IDF (Inverse Document Frequency), temporal and even geospatial reasoning. A new suite of software and platforms, built on a concept called genetic programming (“a technique inspired by biological evolution”) has started to make its way into mainstream commercial applications. The algorithm here “begins by randomly combining various mathematical building blocks into equations and then testing to see how well the equations fit the data. Equations that fail the test are discarded, while those that show promise are retained and recombined in new ways so that the system ultimately converges on an accurate mathematical model.” What this essentially means is going beyond keyword search-based correlations and moving to more semantic-oriented searches that combine machine learning with natural language processing. This in turn requires serious software brains (smart programmers using and refining the right algorithms and models) and muscle (massive learning and training sets in the hundreds of gigabytes running on clusters of tens of thousands of nodes). 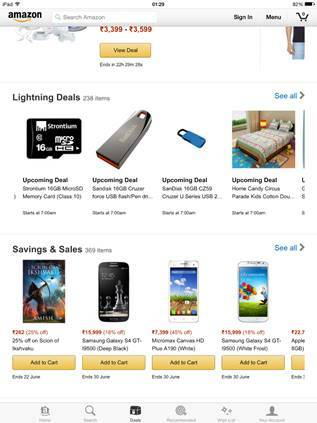 If Flipkart is serious about the mobile ad business (about which I have expressed my reservations), even then it needs to get to the holy grail of deep-learning in ad-tech – “Inferring Without Interfering” the customer’s intent.” In any event, this policy will only stand Flipkart in good stead. If they are already doing so, then good, but the proof is not in the pudding as much as in the eating of the pudding. A critical differentiator in the coming times is not, I repeat, not, going to be driven by slick UIs or gimmicks on mobile apps like “shake to see offers”, but by offering truly intelligent and immersive experience that are feasible even today. Advances in machine learning, and capabilities such as voice, video, location, and more, when used in tandem will power the next set of innovations. Rather than stick to the tried and tested and old way of making users search using simple keywords and correlations and prior history, e-tailers need to make the shopping experience more intelligent. Appendix 2 and 3 outline possible use-cases. It should be clear that both Flipkart and Amazon have a long, long way to go before realizing anything close to the vision outlined, but without such advances, competitors like Google will find the wedge they need to prise open this market for themselves. Second, Flipkart (or even Amazon for that matter, or SnapDeal, or whichever competitor you happen to care about, though in this case the admonition is more targeted at Flipkart in light of its mobile-only pronouncements) needs to get serious about the mobile platform. 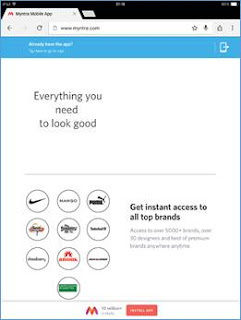 Browse to either Flipkart or Myntra’s websites from a browser on an iPad and you are asked to use their app instead. 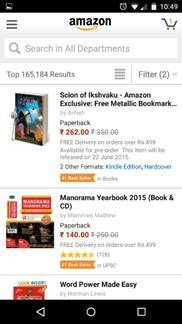 Would you believe if I told you Flipkart does not have an iPad app (as of 15th June 2015)? No? Go check for yourself – I did! Ditto for Myntra (the online fashion retailer Flipkart acquired in 2014)! See Appendix 1 for what I found when I downloaded their apps on my iPad tablet. This would be comedically farcical if serious money weren’t riding on such decisions. Third, Flipkart needs to get into the cloud business. And yet I argue that Flipkart should get into the cloud business. As I wrote last year, Flipkart had to invest substantially (per my estimates, more than one hundred crore rupees, or somewhere in the vicinity of $15-$20 million dollars – which is not chump change) to build its capacity to stand up to the traffic it expected for its “Big Billion Day”. This is in addition to the regular additions it must be making to its computing infrastructure. All this is not surprising, given that the retail business is prone to lumpiness in traffic – a disproportionate amount of traffic is concentrated around sale events, or holidays. For example, while Amazon reportedly had ten million Prime subscribers in March 2013, it reported that over 10 million “tried Prime for the first time” over the holidays in 2014 (traditionally the period between Thanksgiving and Christmas). To prevent web sites from keeling over under the crush of holiday traffic, companies invest substantially, in advance, to make sure the web site keeps chugging along. The flip side is that for those periods when traffic is more average and a fraction of peak traffic, all those thousands of computers, the hundreds of gigabytes of memory, terabytes of disk space, and gobs of network bandwidth capacity are lying idle – depreciating away, obsolescing away. Amazon realized this a decade ago and started building a rental model around its excess capacity – this was the genesis behind Amazon Web Services. 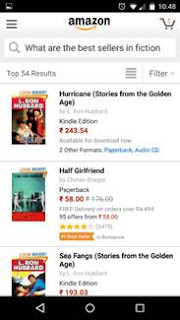 There is no reason for Flipkart to not do the same. What works for Amazon has worked quite well for Flipkart. If it spins off its entire e-commerce infrastructure into a separate entity, it can palm much off the capital costs of its computing infrastructure to the cloud computing subsidiary, substantially improving its balance sheet in the process. You could argue this is nothing but an accounting gimmick, and I am not going to argue with that aspect of the decision - there would be undeniable and real benefits to this decision, and it’s childish to expect a business to be run on utopian principles. As things stand, the state government of Telangana is already assiduously wooing Amazon to invest in an AWS centre in the state. Once operating on Indian soil, Amazon will be able to meet legal requirements that require certain categories of data to remain with the national borders. Any industry so heavily influenced and shaped by technology as the e-commerce industry would do well to listen to the winds of change. If unheard and unheeded, these winds of change turn into gale storms of disruption that blow away incumbents faster than you can imagine. “Mobile-only” is a useful-enough mantra, but translating that into an “app-only” sermon hints at myopic thinking – a troubling sign for sure. It turns out that Google “secretly” acquired a company that specializes in “streaming native mobile apps”. Is this a shape of the things to come? How will this transform the world of mobile apps, or even the mobile landscape in general? Time will tell, but “lock-in” may well be a wise strategy for your customers, but a terrible one to apply to yourself.. Appendix 1 - App-solutely Serious about Apps? 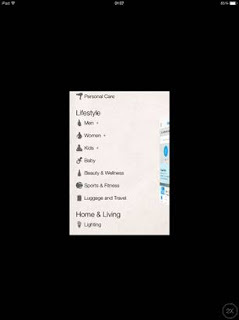 Fire up your favourite mobile browser on an Apple iPad and browse to Myntra’s website (that would be www.myntra.com). You are greeted with a message to vamoose to their mobile app, because after all, Myntra is all about mobility – social mobility in fashion, and mobile devices when speaking more literally. 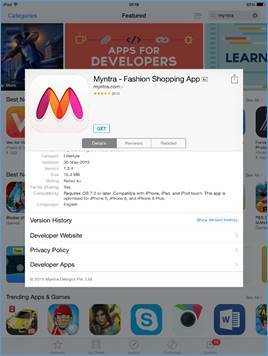 Incredulity hits you in the face when you realize that (on the Apple App Store) the Myntra app is “optimized for iPhone 5, iPhone 6 and iPhone 6 Plus”, but not the iPad. Yes, you read that right – the web site that tells you have to use its mobile app and mobile app only on an iPad does not have an app optimized for the iPad. I am, however, somewhat of a cynical person. I tried searching for the keyword “myntra” on the Apple App Store. The only filter applied was to look for “iPad Only” apps. Here are the beatific search results. Indian gave the world the concept of zero, and the search results page gave one practical application of that elegant mathematical concept. 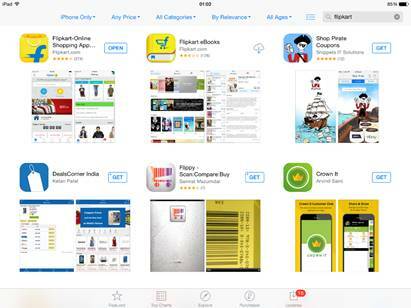 Figure 3 - Search results for "iPad Only" apps on the Apple AppStore for "myntra"
So where was that Myntra app hiding? I changed the filter to “iPhone Only”, and true-enough, there was that Myntra app. In case you are wondering how that was even possible, know that most apps created for the iPhone (or iPod Touch) can run on an iPad without any modifications – all that is required for you to keep this in mind when compiling the app. Apple calls this a “Universal app”. Now that can’t be so bad, right? After all, the app is available on the iPhone and the iPad, so where and what is the grouse? I will come to that in just a bit, but take a look at what the Myntra app looks like when run on the iPad. This is how the app runs inside an iPad. You have the option of tapping the “2x” button, after which the app uses the full screen, but by scaling everything to twice its size. There is no other intelligence here being applied – like changing the icons, or the text, or adding more features. This is iOS doing what little work you see. 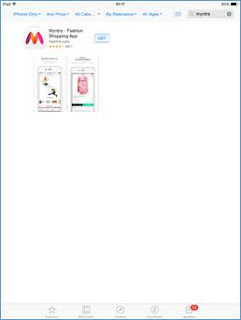 Why this arouses incredulity is due to the stunning dissonance one experiences – between the statements of the Myntra (and Flipkart) executives going to town about a “mobile-only” world on the one hand and the reality of a missing-in-action iPad-optimized app on the other. Yes, one could make the argument that Apple commanded a stunningly low single-digit share of 7% of the tablet market in India, but to make this argument is to negate your very philosophy of a “mobile-only” world. Mobile includes smartphones, tablets, phablets, wearables (for which Flipkart does have an app! ), smart-TVs, and even embedded devices. Flipkart’s mobile web site works - at least for now - on the iPad (though it does not on a smartphone – you have no option but to use their app), but the story is not much different there. No iPad-optimized app, but a smartphone app that does duty on the iPad by virtue of it being a “Universal” app. It’s not as if Amazon’s iPad app is much better. Yes, they do have an iPad app, but it looks more like a hybrid app – a native shell with an embedded browser snuck in, and very little by way of any tablet optimizations. Mobile shopping apps like Flipkart and Amazon provide you the option of inputting your search query via voice (more because of the support the underlying mobile OS provides), but that forces you say out aloud what you have typed – keywords, and nothing more. Unlike the stunning Hound demo or the capabilities of Google Now, e-tailers have yet to leave the stone age in search capabilities. While Hound can understand and answer (correctly) queries like “Show me hotels in Seattle for Friday, staying one night” and then support refinements to the query like “Show only the ones costing less than $300” or “Show only the ones that have three or four or five stars that are pet friendly, that have a gym and a pool, within 4.5 miles of the Space Needle”, and Google Now can understand foreign accents (like my Indian English accent) and parse phrases like “ghat”, “jyotirling” and more, a relatively simple phrase like - “What are the best sellers in fiction” – leads to disappointment on both Amazon and Flipkart’s mobile apps. 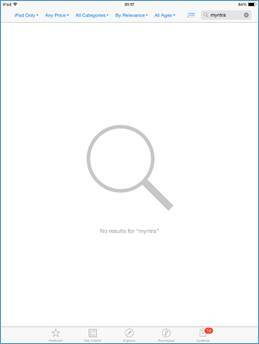 I tried another search – “Suggest books for children”. 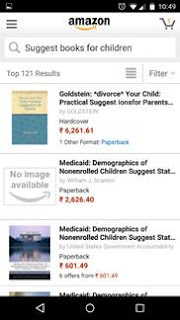 I don’t know what to call the search results, but one with “*divorce* your Child” as the first result is surreal. To complete my brief experiment on Amazon, I tried “Show me best sellers in electronics”. That also did not yield any relevant results. 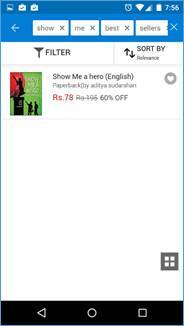 Flipkart is not much better, and at this point we are really looking at rock-bottom as the baseline. Even a marginal improvement would be welcome here. Sadly, not the case. Though, Flipkart does separate each word out and allow you to delete any one word to refine your search. Given the abysmal quality of search results, it is somewhat of a zero-divide-by-zero case, resulting in only infinite misery trying to find the right combination of keywords that will yield the desired results. 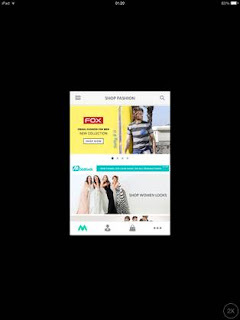 Does the Myntra app fare any better? Predictably, it doesn’t. 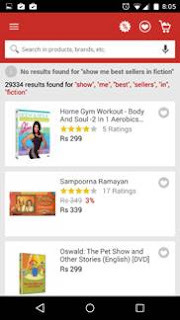 If semantic search in the e-commerce space was a problem that had been cracked by either Flipkart or Myntra, it would have been shared across both platforms by now. Even Google, with its oft-stated e-commerce ambitions, , and the eye-popping advances that it has made with its voice-based search (Siri from Apple and lately Cortana from Microsoft also deserve to be included, but neither company seems to be quite interested in e-commerce at the scale of Amazon, yet) left me disappointed with a simple search like – “what are the fiction best sellers in India”. Me: send me free e-book samples of the first five books from this list and remind me in one week whether I want to purchase them. Me: show me LED TVs that are HD, 40 inches or larger, cost no more than Rs 60,000, and can be delivered in the next three days. Me: Which among these would be most relevant to me? Me: summarize the most useful reviews for the first TVs, and keep each under two minutes. Far-distant utopia? Naah, I don’t think so. This is within the realm of the possible, and I expect to see this become reality in the next two years. Today, however, we are some ways off from the innovations where online shopping will become a truly immersive, interactive experience akin to having a natural conversation with an incredibly knowledgeable yet infinitely patient salesperson. Me: (standing amidst the ruins of Hampi) Suggest some good books about this place. Me: place the first, third, and fifth items in the shopping cart, record this and deliver to my wife. Then rent to stream the third movie in HD format on Saturday evening.